Born in London, Cary Adams has a BSc Honours degree in Economics, Computing and Statistics from the University of Bath, United Kingdom and a Masters degree (with Distinction) in Business Administration. He is a Harvard Business School Alumni having attended the School’s Executive General Management programme in 2003. 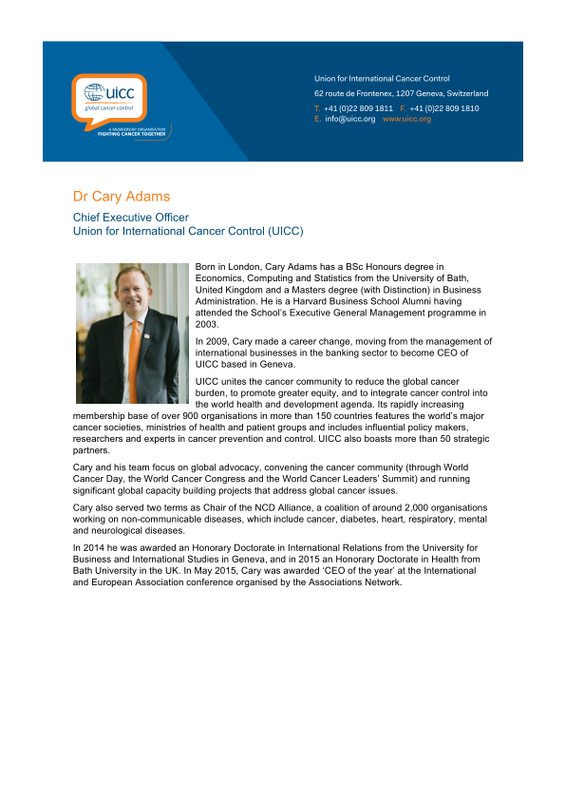 In 2009, Cary made a career change, moving from the management of international businesses in the banking sector to become CEO of UICC based in Geneva. UICC unites the cancer community to reduce the global cancer burden, to promote greater equity, and to integrate cancer control into the world health and development agenda. Its rapidly increasing membership base of over 1000 organisations in more than 150 countries features the world’s major cancer societies, ministries of health and patient groups and includes influential policy makers, researchers and experts in cancer prevention and control. UICC also boasts more than 50 strategic partners. Cary and his team focus on global advocacy, convening the cancer community (through World Cancer Day, the World Cancer Congress and the World Cancer Leaders’ Summit) and running significant global capacity building projects that address global cancer issues. Cary also served two terms as Chair of the NCD Alliance, a coalition of around 2,000 organisations working on non-communicable diseases, which include cancer, diabetes, heart, respiratory, mental and neurological diseases. In 2014 he was awarded an Honorary Doctorate in International Relations from the University for Business and International Studies in Geneva, and in 2015 an Honorary Doctorate in Health from Bath University in the UK. In May 2015, Cary was awarded ‘CEO of the year’ at the International and European Association conference organised by the Associations Network.